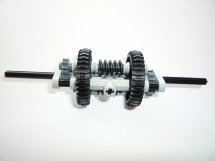 You may remember a previous post (TechTips 20), about 'Limited Slip Differential' implementations made with LEGO TECHNIC. As a follow-up to that previous topic, lets take a look today into a more sophisticated and realistic solution, based on the Torsen Differential design. The Torsen Differential or Torsen Traction, is another type of limited slip differential (LSD) used in automobiles. Torsen was invented by the American Vernon Gleasman and got its name from a contraction of Torque-Sensing. 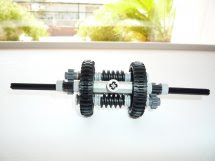 It is a purely mechanical device which exploits the fact that worm gears cannot be back driven; it has no electronics, clutches or viscous fluids. 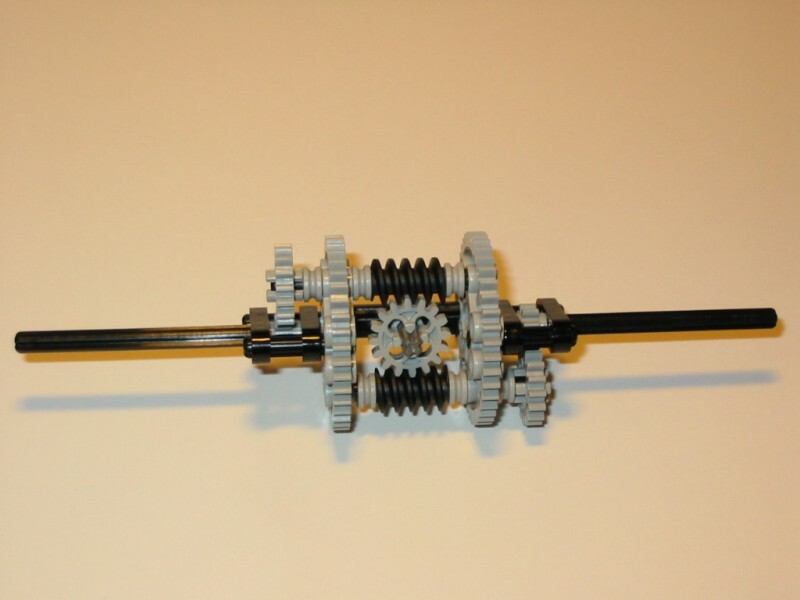 Works as an open differential when the amount of torque going to each wheel is equal. As soon as one wheel starts to lose traction, the difference in torque causes the gears in the Torsen differential to bind together. 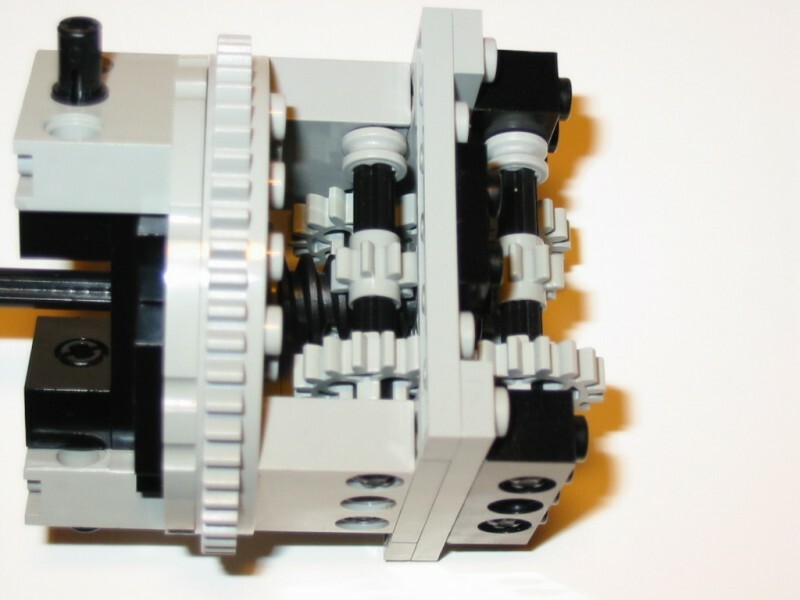 The design of the gears in the differential determines the torque bias ratio. For instance, if a particular Torsen differential is designed with a 5:1 bias ratio, it is capable of applying up to five times more torque to the wheel that has good traction. 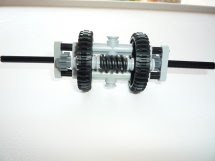 Compared to the example on the previous post above mentioned, this is a solution closer to that used in real mechanics, while it is not affected by the situation where the differential locks without slippage and due to small variations on wheel rotation speeds as the vehicle turns. These devices are often used in high-performance all-wheel-drive vehicles. The main advantage of a limited slip differential is shown by considering the case of a standard differential where one wheel has no contact with the ground at all. In such a case, the contacting wheel will remain stationary, and the non-contacting wheel will rotate or slip freely, and thus the vehicle will remain stationary. In everyday use on typical roads, such a situation is very unlikely, and so a normal differential suffices. For more demanding use, such as driving in mud, off-road, or for high performance vehicles, the LSD can be employed to deal with it. By limiting the angular velocity difference between a pair of driven wheels, useful torque can be transmitted as long as there is some traction available on at least one of the wheels. This is achieved by locking the differential whenever a slip situation occurs. Below some images that compare Conventional (left) and Torsen Differential (right) internal designs. 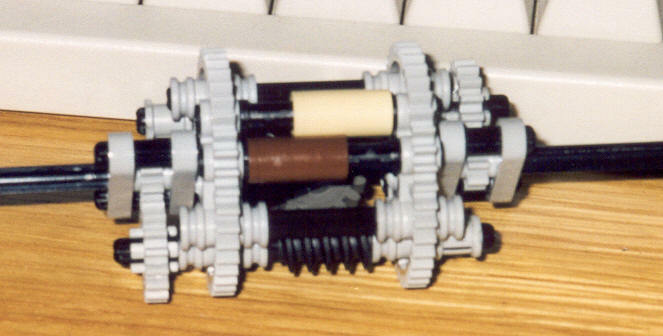 The first Torsen implementation made of LEGO, was done by Rob Stehlik back in 2002. Below some pictures of his implementations. One first (left) closer to the real thing, and one further simplified LEGO version but still functional (right). See Rob's webpage, for further details. 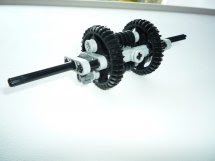 Or you may want to use the instructions and .Dat file under Mike Fusion's LEGO TECHNIC and MINDSTORMS page. 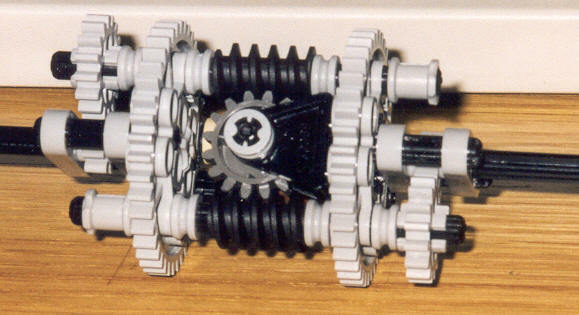 The blue gear, is the differential input. And below also some better photos taken from Mike Hatton's (Parax) reproduction. Main issues with the designs above, seems to be strength and the not so compact size. Thus some limited applicability into real models. Meanwhile a Spanish reader (Carles Lacosta Morell), sent me images from a bit more compact design of is own. 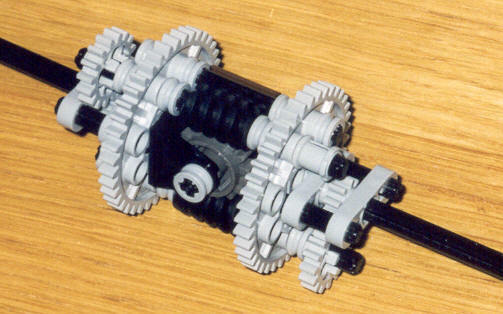 He is using two 36T Double Bevel gears for the structure, instead of the larger 40z ones above. Guess however the bias ratios, might be different as well. And still some other Torsen images, found at BS, with a slightly different structure. Since these same images appear replicated into several folders, don't know who's their original author. As Paul (Sariel) just commented, there is still a slightly smaller design from a LUGPol fellow. the last one is ultra cool, I had to build it!, but a bit dissapointing that with big forces it just forces itself appart. Am working on making a custom built tor-sen differential housing through 3D printing. will require two worm gears, six 8 toothed gears, 6 2 notch long axles and two output shaft axles of at least 3 notches in length. Housing comes as two identical half's. Input through a 24 toothed gear. All looks very promising. Hopfully if good enough, Lego may adopt the part as a official part. Somehow, both halves must be tight together. Your design looks great. Wish to have something like that to test. Somehow both halves need to be tight together and the solution you proposed earlier doesn't seem to me the most adequate from a Technic design perspective. Somehow it should be allowed from the holes closer to the junction among halves. Well, while I'm still worried about it being weak where it thins to 2mm, I won't get a chance to test it as my finances won't allow me any more luxuries till next I get some cash. Additionally, if this works, but Lego doesn't take it up, getting these is going to be expensive. It's £4.90 ($7.91) per piece, an the minimum order price is £15.46 ($25.00), and the new piece is £4.68 ($7.56). Well, the company that makes these parts for me has a large backlog of orders due to a huge influx of new users, and while I'm still waiting for them to produce a part I ordered a while ago, I can still show you the piece on their site. Also, would it be possible for someone to provide ideas on how to test the part out once I have it (besides basic functionality)? So the part arrived, and though it was functional by hand, after running it with an NXT motor without any gearing up or down and directly onto the wheels that come with the NXT set, the sections I was worried about gave in after being under strain for about 20 seconds. The strain was the weight of the vehicle while one wheel was held in the air. While the vehicle was turning or moving in a straight line, the part held up indefinitely from what I could tell. but when the differential locked up as it was supposed to, creaking noises could actually be heard. I'm contemplating trying a stronger material, but this is really only a "sticking a plaster" on a problem rather than addressing it. Further more, using a vastly different material will put strain on the other Lego parts as they were only really designed to work with the plastic they're made from. At this point I'm open to suggestions on how to improve the design, I have one or two issues I know how to iron out, but the base strength of the design is still a problem. I'll take some photos of the damage to give you a better idea of the problem. Were this produced in a 3D prototyping printer? The material and methods used in these, lead to very fragile models. 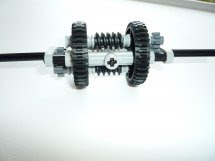 They never can be used in LEGO Technic model, where there are some forces involved.